A variety of robots, from traditional industrial robotic systems to today’s latest collaborative robots, rely on sensors that generate and process large volumes of highly varied data. 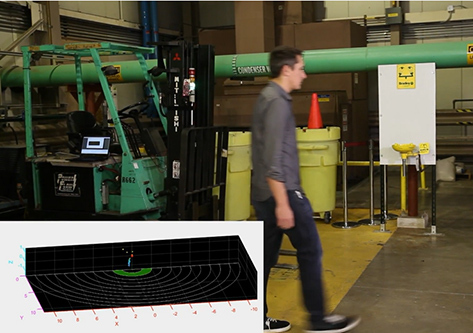 This data can be used to enable autonomous robots that can make real-time decisions, resulting in smarter incident management while maintaining productivity in dynamic real-world environments, as shown in Figure 1. Texas Instruments’ millimeter-wave (mmWave) sensors have the ability to process data on-chip with the integrated processor for real time decision making. This integration enables smaller designs compared to some light or vision based sensors. Additionally, having the capability to detect multiple objects and process data with only a single sensor reduces overall system costs. Immunity to environmental conditions such as dust, smoke and variable lighting is another important consideration in a factory setting. mmWave sensors can operate in any of these conditions – and be mounted behind enclosure plastics – without the need for external lenses, apertures or sensor surfaces. All of these attributes enable mmWave sensors to perform well in industrial sensing applications. 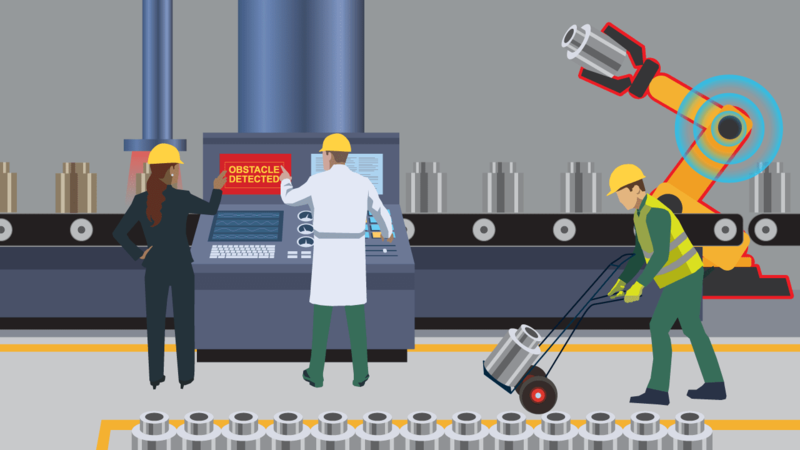 Intelligent edge processing allows factory machines and robots to interact with humans and reduce incidents. For instance, mmWave sensors can be configured to monitor a specific area of interest around machinery, define keep-out zones and trigger a warning to people in the area. These zones can be partitioned so that the sensor can react accordingly based on zone occupancy or proximity of a person. Figure 2 illustrates this feature with zones marked safe (green), warning (yellow) and danger (red) to indicate proximity to the machine. mmWave sensors enable the accurate measurement of not only the distance of objects in their field of view, but also of the relative velocities of any obstacles. This enables robots to take more predictive action, such as stopping the machine, based on how fast objects are approaching the sensor. Figure 3 shows how quickly the machine triggers the danger-zone warning based on the speed of the person approaching the machine. To improve productivity, you want the machine to avoid stops due to false triggers. The example in Figure 4 shows how integrated tracking algorithms enable the sensor to accurately determine the direction of a person. When a person is walking away from the machine, it does not turn on a warning signal and takes no other action. To simplify the design of robotic systems and reduce development time, download the Area scanner using mmWave sensor reference design using the new IWR6843 evaluation module (EVM). This EVM works on the 60-GHz frequency band and integrates a complete radar processing chain onto the device. Discover the benefits of mmWave in safety guard applications. Learn more about mmWave in intelligent robots in the whitepaper How sensor data is powering AI in robotics.